To be frank, this my first attempt to Jailbreak my iPhone 4s running iOS 7.0.4, and I did it successfully without any problem in the first attempt itself. So I’m sure you can also do Jailbreak yourself if you follow this guide. There is nothing complemented with these steps, it’s really easy to follow this guide and it takes only few minutes. Note: I’m using my iPhone 4s here, so in this post I will use the iPhone term to represent the apple device. Once you have all the requirements, our next step is to take the full backup of our iPhone. So to take backup connect your apple device to your PC and launch iTunes. Select the device >> choose Summary >> Backups >> This computer >> and click Back Up Now button to backup your iPhone to computer. If it opens pop up box asking Need to backup Apps, then choose Yes. How you Updated your iOS? This is really important step. We can update our iOS in two ways one by Over The Air (OTA) and another method is by downloading Firmware (IPSW) files. OTA is a method where we update our iOS through Software update option (Settings>General>Software Update) which comes on our apple devices. In most cases we update our device by using this method. In Firmware (IPSW) files method we use iTunes to update our apple device to latest iOS by downloading right firmware. To jailbreak your device successfully without having any problem, we need to update our Apple device using Firmware method or else you will stuck in the middle of the jailbreak process. So it is highly recommend you to download right firmware for your device and then restore your device using that firmware file and continue to jailbreak. 2. To update your Apple device with firmware using iTunes, connect your iPhone/apple device and open iTunes, go to summary tab and click Check for Update or Restore iPhone (Recommended) button by pressing Shift Key and choose downloaded firmware. Now your device should update. It will take few minutes to complete. 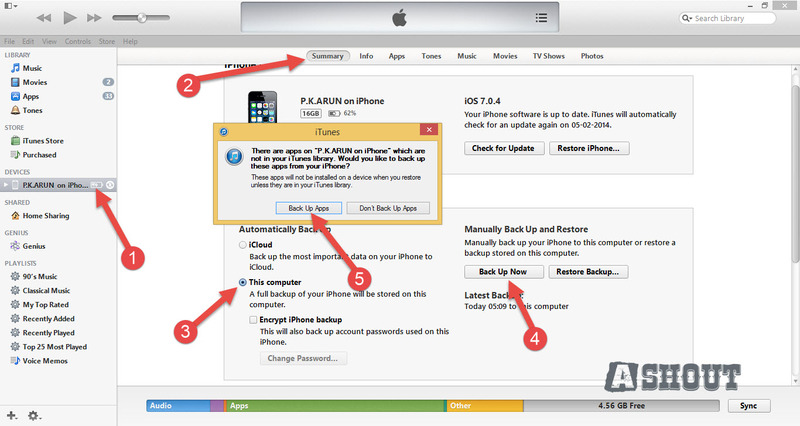 Once you complete this step move on to Jailbreak process. 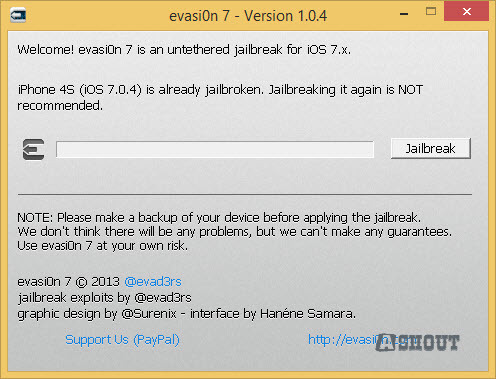 To Jailbreak iOS 7, first download evasi0n7 software and connect your iPhone or apple device to your computer. If your device is supported, then it will display supported message. Once you got that message just click on Jailbreak button to Jailbreak your iOS 7-7.0.4 devices. It will take 5-10 minutes to jailbreak. During this process you have to interact with your iPhone for few times so you stay there itself. Once you complete the process you will see Cydia app. That’s it! 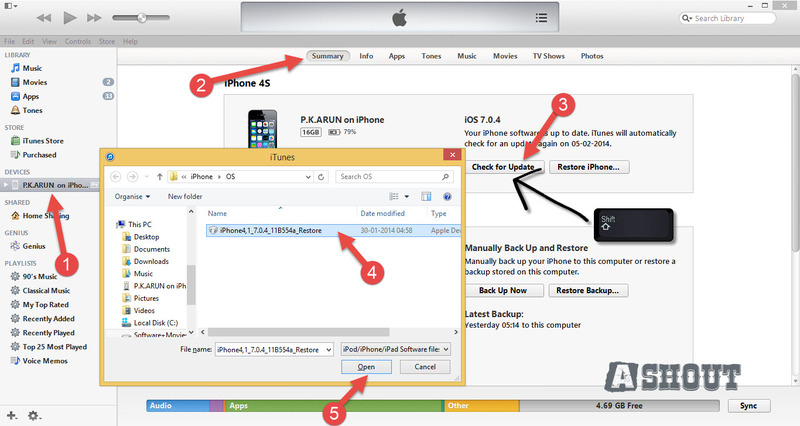 Now your iPhone or Apple device running iOS 7-7.04 is successfully Jailbreaked.